One of the tournament officials sent me an update on the rules for an indoor competition being held in Georgia. There are so many rules and so many archery governances it is hard to keep it straight. In fact, I hadn’t yet reviewed the rules for the upcoming event. When the correction came my way it got me thinking. That set of rules has been part of many of my medical lectures given work wide for over a quarter of a century. These rules, wherein the violation of just one is serious, led me to create other rule sets for different situations. For Triathlons I have a set of rules. These came about when I was asked what I try to do during a triathlon. The question gave me pause. There is a lot I do in preparation for a triathlon. During the event I am on autopilot, enjoying myself trying not to think too much. What do I think about during a triathlon? These archery rules are simple. They are a bit “relaxed” but I think “relaxed” is a good frame of mind for an archery tournament. Besides, it is supposed to be fun. The opinions offered to me regarding keeping score during practice are mixed. There is a camp that advocates never keeping score. There is another camp that promotes keeping score. Something, not all the time, I record practice scores and for a number of reasons. The primary reason is so that in competition, I am accustom to having a score in my head. The score needs to become a number that doesn’t lead to pressure. What I don’t want is to be in competition and worry about the score. By practicing scoring, I teach myself to record the number after each end, and then forget about it. In this effort, I record the number for each end and don’t look at the total. I’ll total the score once I have completed the session. In this manner, I am teaching myself to not focus on the score. The second reason is to see where I set against other archers. For major indoor tournaments, scores are posted. At the moment, I am preparing for an indoor tournament and it is nice to have an idea of where I’d place today, and to set a goal for the competition. In competition, I know to set a realistic goal. For example, if I am not shooting 60 X’s in practice, it is unlikely I will do so in near competition. At this point, that doesn’t cause me to worry. I go into each match to shoot my best to hit the X on every shot. When I began shooting I shot below 460, today I shoot on average 560 (without adding a point for each X, 600 is max score). By watching my score I can evaluate progress. What my data reveals is that there has been an 18% improvement of my shooting scores on a FITA 3-spot over the past 12 months. The scores are collected about once a week. Practice is 5 to 6 days a week. As such, my scoring sessions represent 20% of my practice days. The other days I work on form, distance shooting, judging yardage, and when possible shooting 3D targets rather than paper. 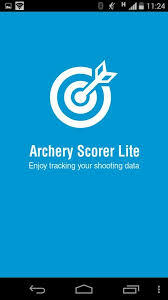 The primary objective with taking score is the first reason, to become accustom to tracking score while in competition. Duplicating, as close as possible to an actual event helps during a tournament. It is also reassuring to monitor progress and have an objective measure of where I’ve been and where I need to improve. When I practice I draw a unique crowd. River, my lab, feels it is her duty to supervise each shot. There are times she’ll climb a stand to coach 3D practice. 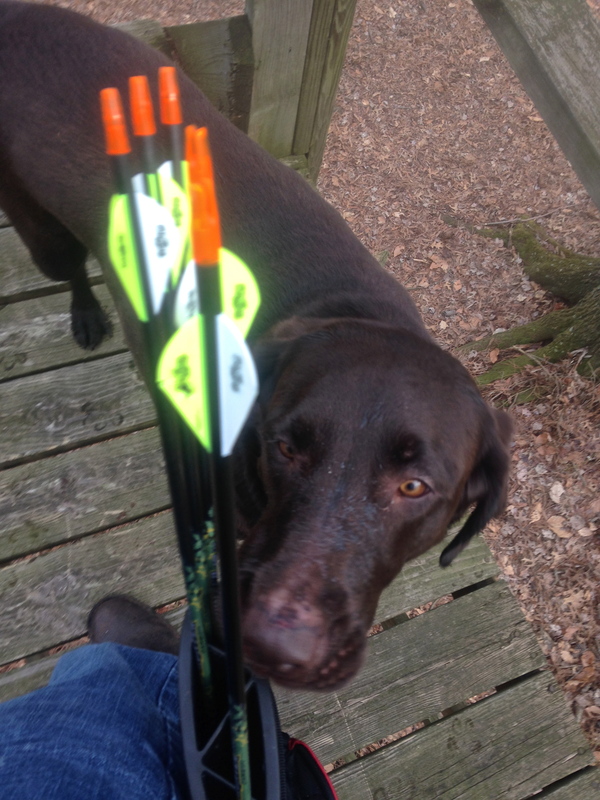 Honestly, a dog and archery seem well suited. 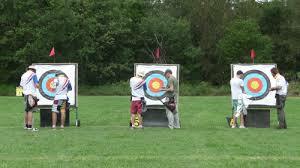 Two other observers of my practice are likely better suited and have a rich history in archery. River on her way to a foam animal to measure my shot. In the country we have many free-range animals. The primary domestic varieties are chickens, dogs and cats. Wild animals are vast and plentiful. 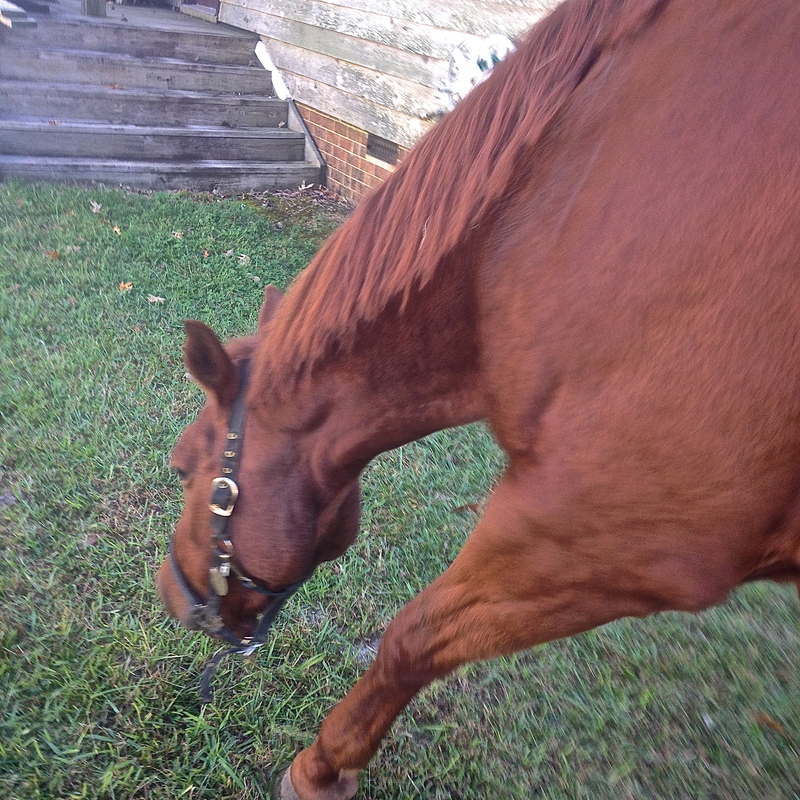 Because we are so remote we have free-range horses. 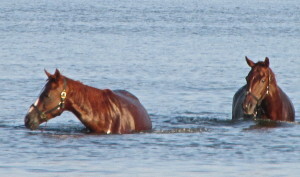 Two, Imperious and Constance, very social mares are frequent visitors. 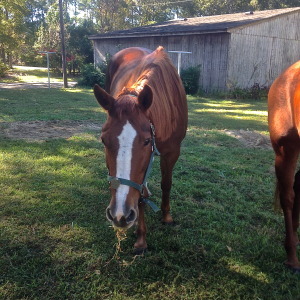 Their stable and small pasture is few hundred yards away. They often escape for better grazing. If I am out shooting both walk over to watch. These two girls will come over, sniff my arrows, always disappointed they are inedible, and hang out. Today, while shooting mid-morning, Imperious spotted me. 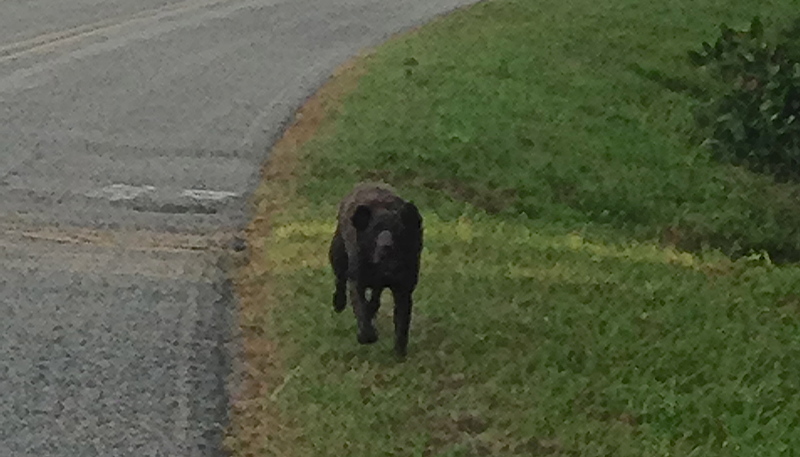 She made a beeline over and was immediately followed by Constance. This happens several times a week. 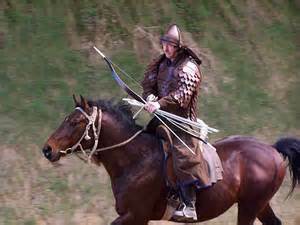 Horses and archers have a rich history. These mares seem to enjoy watching archery. While they observe they always stand behind me to my left. 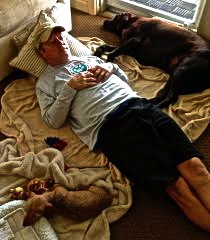 When I take a break I’ll speak with them and give them a pat or rub. 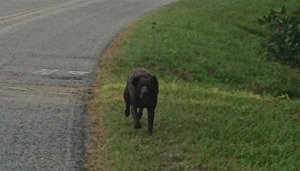 They stay as long as I am out or until someone comes to retrieve them. I don’t exactly understand this relationship and neither horse has ever offered an explanation. Finally, getting my bow right. Several months ago I replaced the string on my Mathews Apex 7. Since then it has never ‘felt’ exactly right. 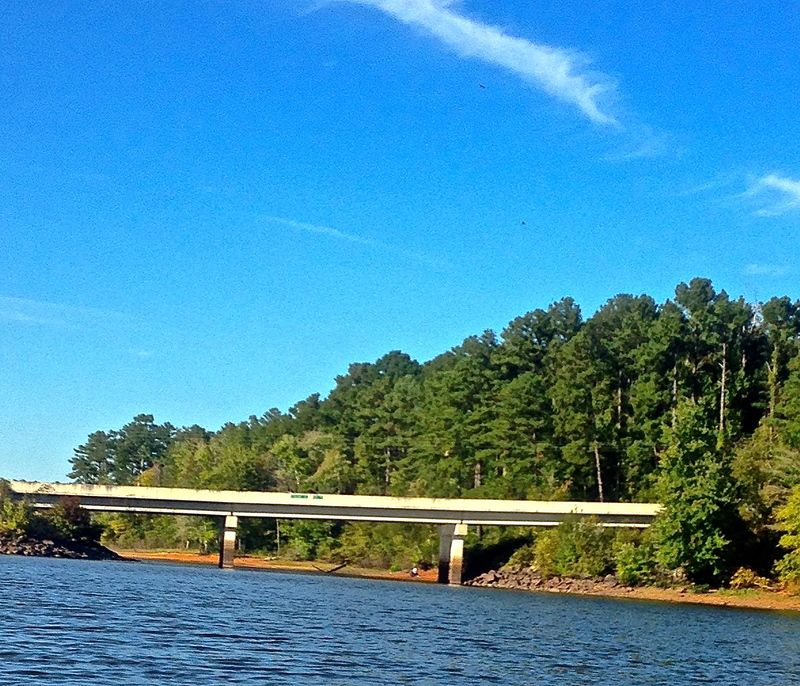 My anchor ‘felt’ off, my head didn’t feel right, the bow vibrated more, and my shots weren’t as tight. The bow had been looked at by a number of shops, none were Mathews dealerships. Because the shops weren’t Mathews dealers none of them wanted to do anything to the bow that might void the warranty. But, they all agreed something was off. 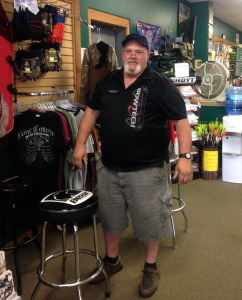 Yesterday, I made the two hour drive to Ernal, NC, to meet with Terry Lewis at Terry’s Archery Plus, who is a Mathews dealer. 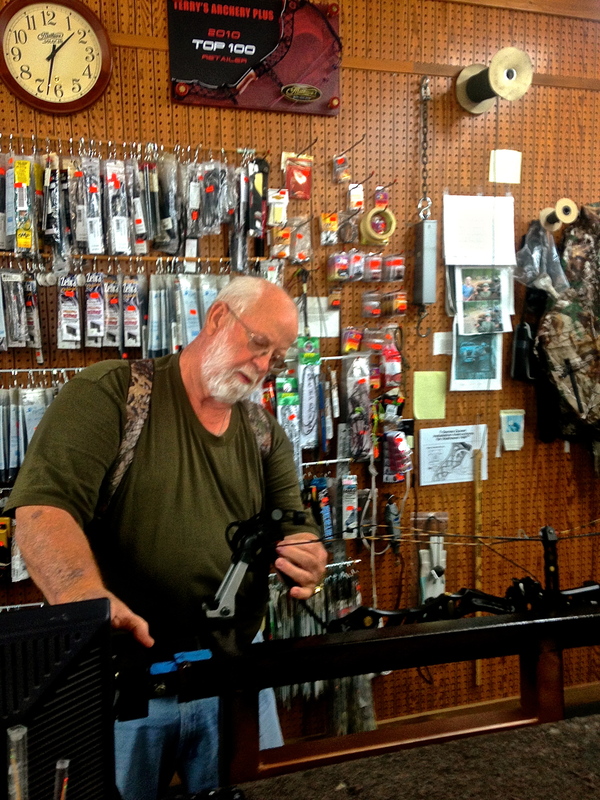 Not only is Terry a Mathews dealer he is truly a bow expert. He made measurements and verified angles. Then, from his assessment, he made adjustments to the string. He solved the vibration problem and worked with my peep. Author David LainPosted on October 24, 2014 October 24, 2014 Categories UncategorizedLeave a comment on Finally, getting my bow right. At times I write about fitness. Aside from archery I’ve enjoyed sports competition and been successful in running, cycling, duathon and triathlon. 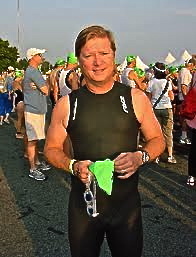 Triathlons are really exciting and fun. The main problem is the expense. An Ironman entry fee is $650.00 or more. 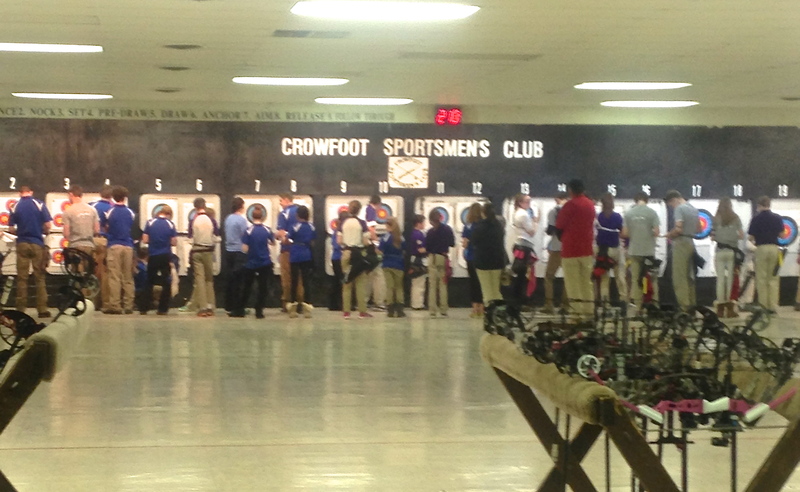 An archery 3D tournament is much less expensive. Duathlon and cycling events are also pricy. Running is a bargain by comparison. During the winter, I search for runs to race. That means spending time on Active.com. I try to get a race per month. In 2014, with all the archery tournaments I missed racing every month. 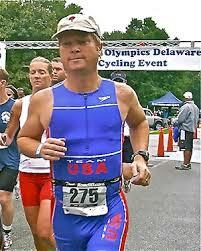 At my current pace by the end of 2014 I’ll have competed in about 10 races and 20 archery tournaments. As the temperatures drop, running becomes by focus, along with hunting and indoor archery competition. This means a lot of training. My days typically begin with a run. 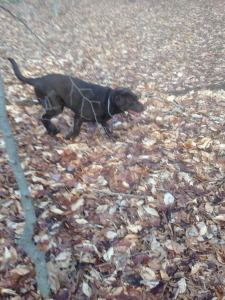 My dog River runs with me. She also comes with me on 3D practice ranges when I have them to myself. 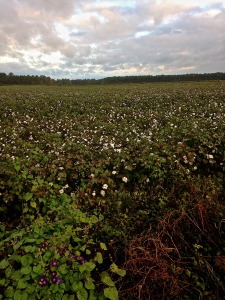 Hunting, at times, can demand physical labor. When I was young, a hunt was a lot more work. Today, with ATVs to bring us closer to our blinds or stands, and to haul out what we might shoot, physical labor is reduced. Still, fitness remains important. 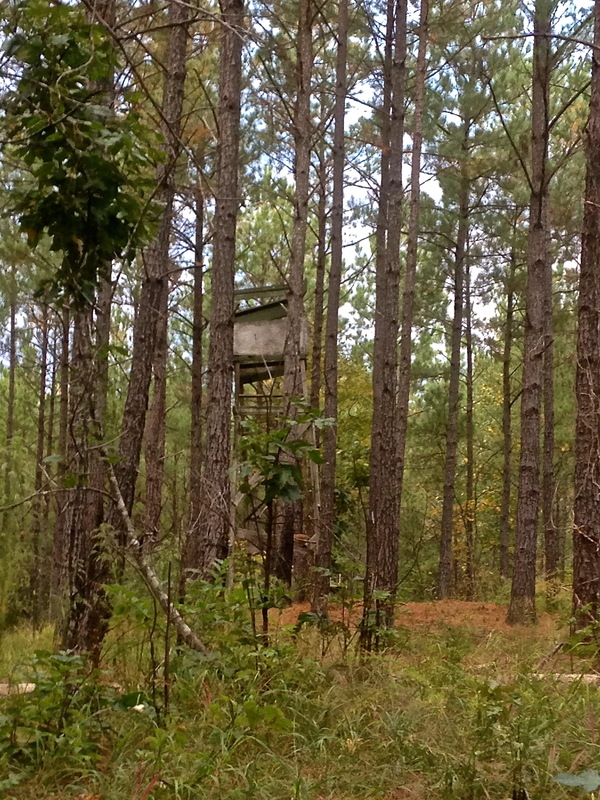 Being unfit and trying to climb a tree stand can be a risk for some people. I have a friend that is in his 70s. He is really out of shape but loves to hunt. Recently, he started a program toward achieving fitness. He has lost 50 pound by walking and eating less. Another friend I have once weighed over 300 pounds. He is a serious archer. Last week, he ran his first half-marathon. Today, he has lost over 100 pounds by changing his diet, running and cycling. 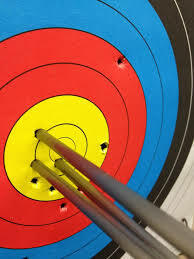 In older posts, I’ve paid attention to archers that are serious about their fitness. Really, it isn’t difficult to maintain and promote your health. Take some time out of your day to workout. If you are out of shape add a quick trip to your physician to make certain nothing has run amok with your heart before you start. If you have no one to work out with, go it alone. Eventually, you will find other people with whom to work out. 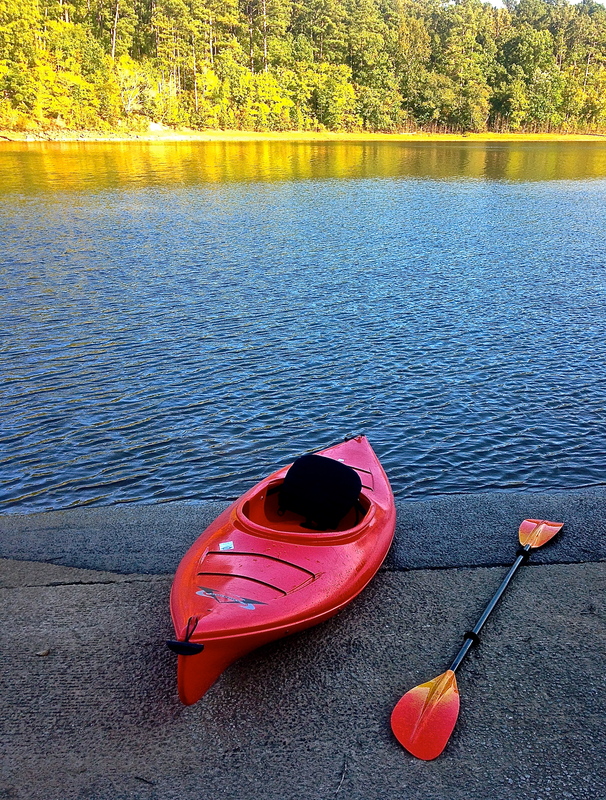 Running solo gives you time to think. Music is nice on long runs as are books on tape. I break it up; some runs I have music or a book on tape. 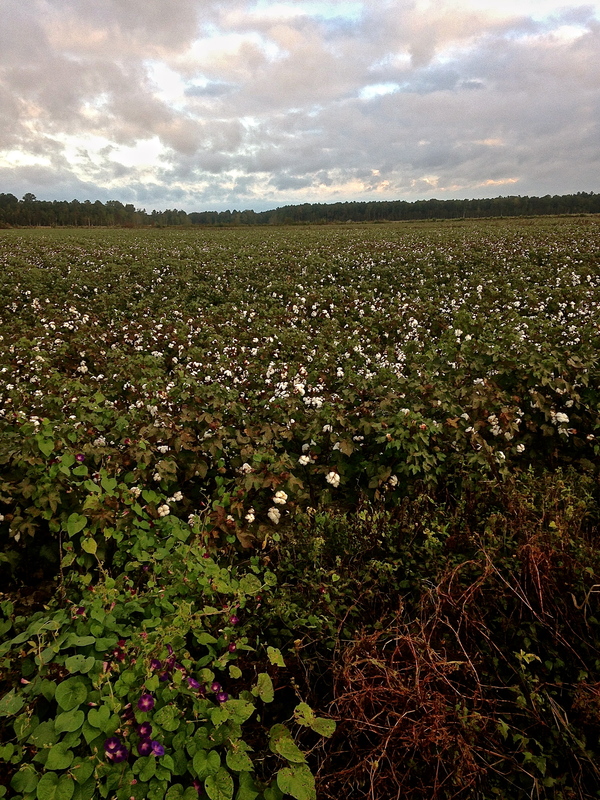 On other runs I leave my iPod off to think and enjoy the scenery. 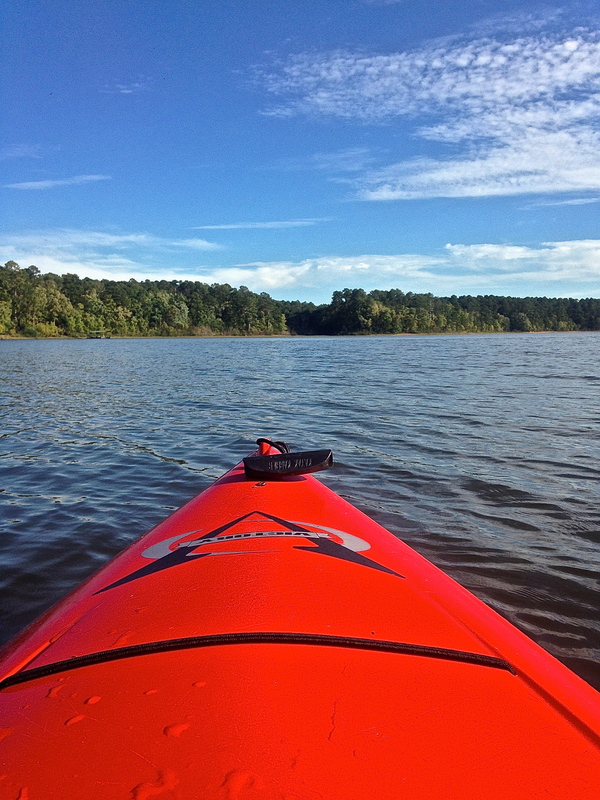 Start slow, find an event, sign up and make it a goal. A 5K run costs between $18.00 and $25.00. You can find one in your town or nearby. Plus, you’ll get a nice T-shirt for your effort. When we took the deer to the processor he showed us his logbook. Only 21 deer since Friday. He said there was a group of about 30 hunters that were at a large hunt club of some sort. The group had been there four days and not a single shot had been fired. We’d seen deer everywhere while driving or when a shot wasn’t available. Ray and I hunted for a few days. He’d shot one deer the week before and we hoped one of us would get another. On Sunday Ray got in a shot and killed a small buck. He gave me this deer so I could have the meat. I am also tanning the pelt. We’ll be back out the week of November 4th. 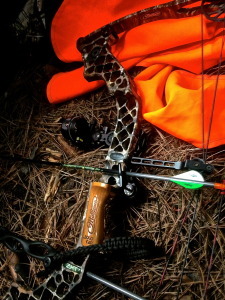 Until then, practice for the tournament in Georgia on November 8th and stay sharp with my hunting bow. 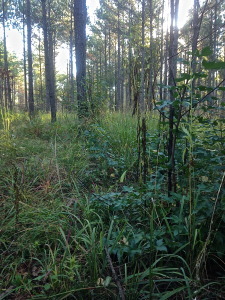 The deer below were only 12 yards away. They could just be seen in the dark. But, at 5:45 AM under a moonless sky it was too dark for a shot even at 12 yards. The brighter the morning became, the less and less I heard from the deer. That didn’t dampen our plans for tomorrow. 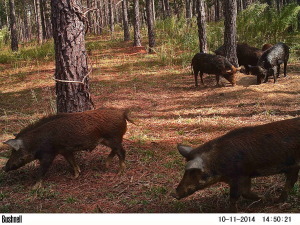 In the afternoon we cruised the land and found where pigs had rooted and deer had rubbed. At various points we dropped feed corn – 300 pounds of it. The process of cruising and dropping corn took three hours. The remainder of the day would be devoted to the Georgia vs. Arkansas football game followed into the night watching Notre Dame vs. Florida State. Tomorrow we’ll head back to new areas with greater possibilities. Another long day with no deer or pigs. 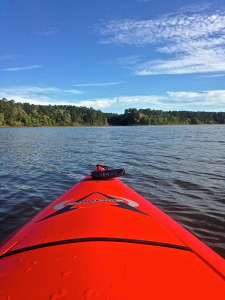 I started alone at dawn, took a break around 2:30 PM and was back in the woods with Brenda, my wife, and Ray, my father-in-law by 4:30 PM where we stayed until dark. None of us got a shot off. In the morning, when driving into the woods six deer raised their tails to my truck. 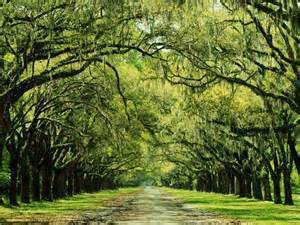 The red clay roads that crisscross our property are narrow and leave little room for error. Deer make a game of hopping across these roads whenever we drive into or out of the land we hunt. This morning I was alone. Ray, who typically joins me, decided to wait and try his muzzleloader at dusk. In the woods, I parked the truck and backed the Bad Boy Buggie off its trailer. 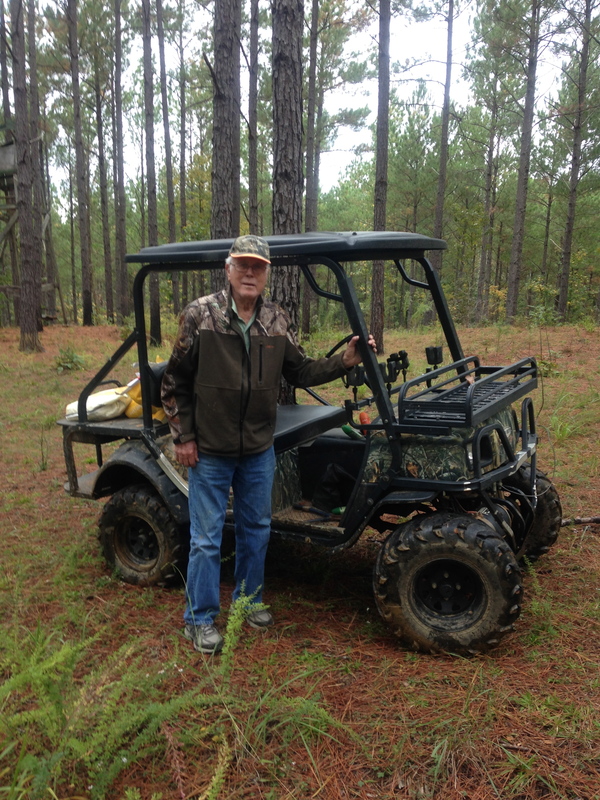 On the four-wheeler I piled my gear and headed to a blind I planned to use for this day. Part of my gear included a horse blanket. The blind has a pine straw floor and the horse blanket would muffle the sound caused by the pine straw and improve comfort. 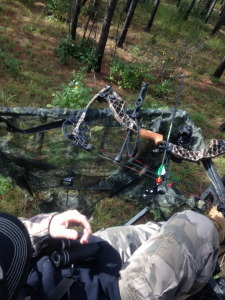 In this blind I have to shoot while kneeling. There is a chair for shooting with a gun or crossbow, but the chair is in the way when using a bow. 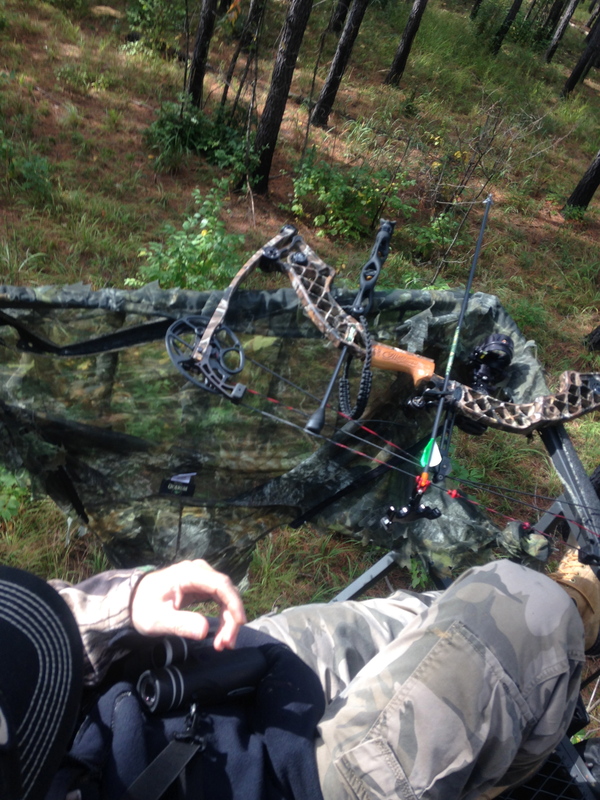 It gets moved out for bow hunting and the ground becomes the furniture. 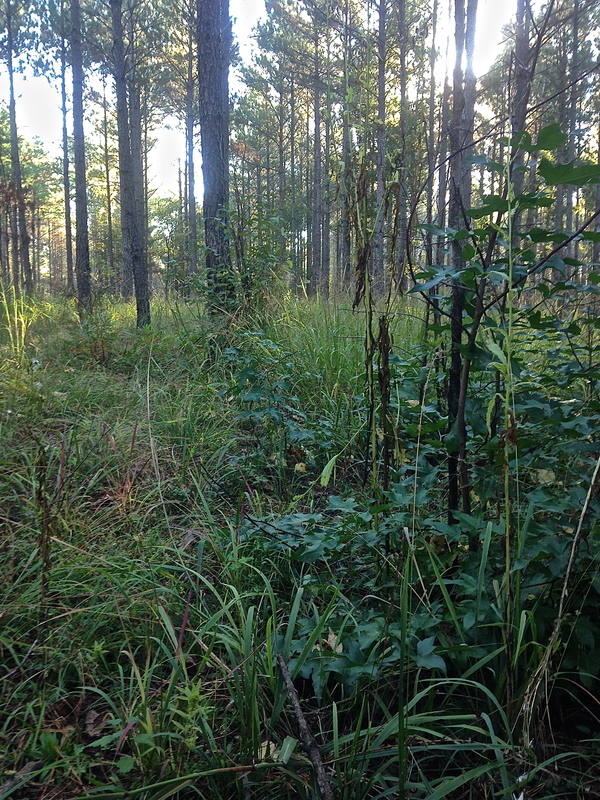 After arranging the blind, testing my draw, ranging various trees and stumps, I settled in to await the deer. There I remained though breakfast, a mid-morning snack, lunch, and a nap, until 2:30 PM when I headed home. 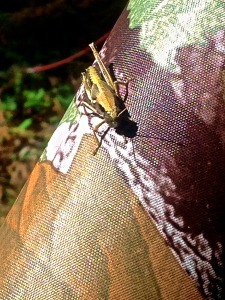 The only critter I saw was a grasshopper. Maybe this evening’s hunt would be better. 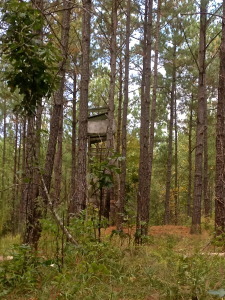 In the afternoon, by 4:30 PM I am back at the same area only this time in a tree stand. Brenda, my wife has come on this hunt. Ray is about a kilometer away in a blind. 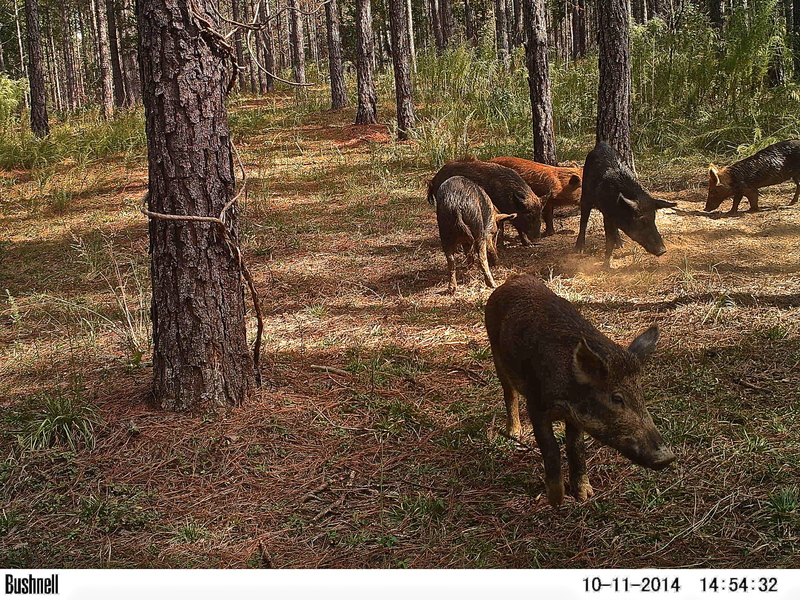 It would be great to write that the wait until dusk hunt brought home the bacon or the venison. 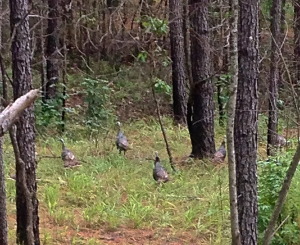 The only game that passed our stand were taunting turkey, which aren’t in season. Do this is a few months my tasty friends! Naturally, driving back to the truck on the Bad Boy Buggie, Brenda and I saw seven deer not 25 yards off the path – par. Ray’s luck had been no better. Still, spending a day in the woods is never time wasted; the short nap on pine straw covered with a horse blanket a real bonus. 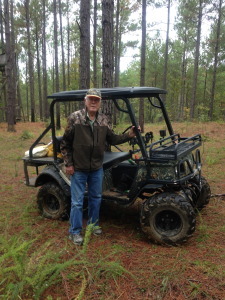 Here in Tignall, GA my father-in-law, Ray, has 679 acres of land used for his hunting club. The members of the club are a few friends and family. The family members include, Ray, Wade, and me. The friends are Guy and Tim. Wade is Ray’s oldest son and an attorney. Guy is Ray’s best friend; both are retired from the Army. Ray was an NCO and Guy was a Chief Warrant Officer and ex-helicopter pilot. Tim is the pastor of their church. 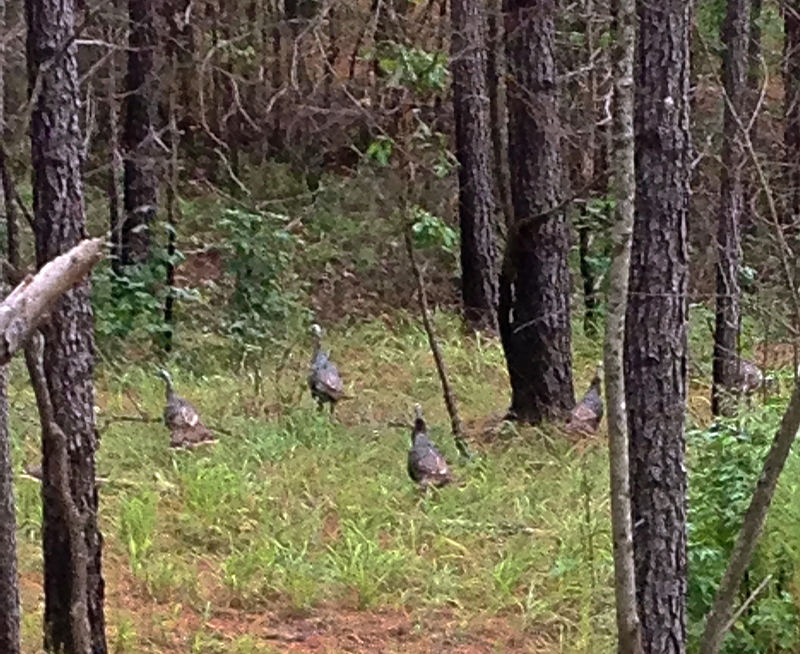 It is a small group and we’ve never all been on the property hunting at the once. This trip only Ray and I will hunt. 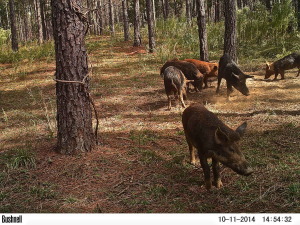 Our prey was primarily deer and secondarily pigs. We aren’t in search of trophies; we are gathering food. “We don’t need anymore deer heads” says Brenda, my wife. I take the Swiss approach so that the deer head debate remains between father and daughter. 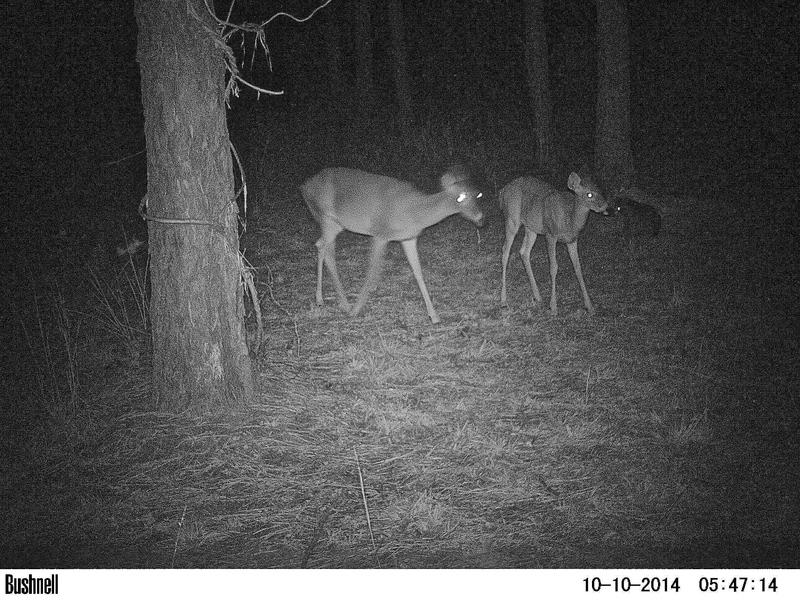 But, if a nice buck happens upon us in the woods – well what will we do? In this house there are 4 full head mounts and two racks of antlers. Ray and I have covert plans for future trips to the taxidermist. The property here is well stocked with game. I have frequently noted that if we hunted with a Ford F-150 we’d never run low on stores of meat. Despite the clear success we’d have hitting deer with trucks, last week Ray resorted to a crossbow to kill a doe, which has been processed. 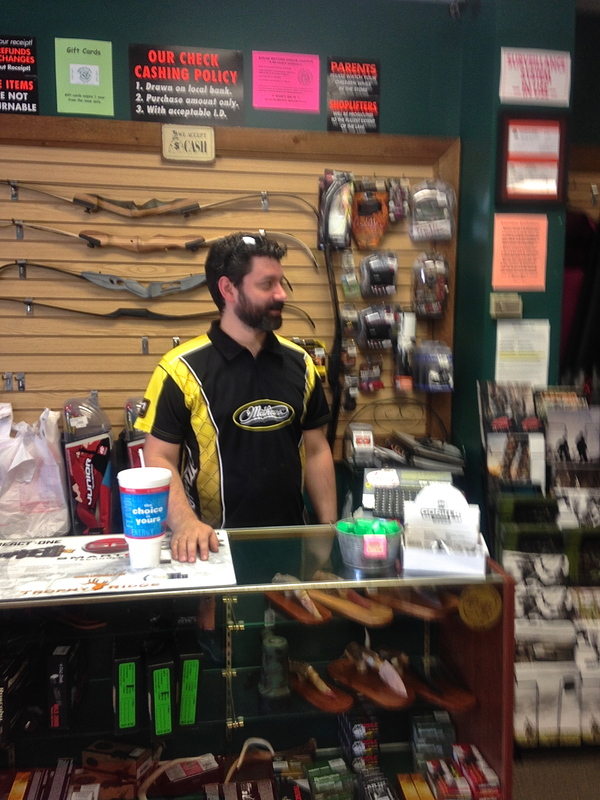 This week he’d hunt using a black powder gun, his Pursuit Pro 50 caliber, made in Spain by Ardesa. I’d be using my Mathews ZXT. 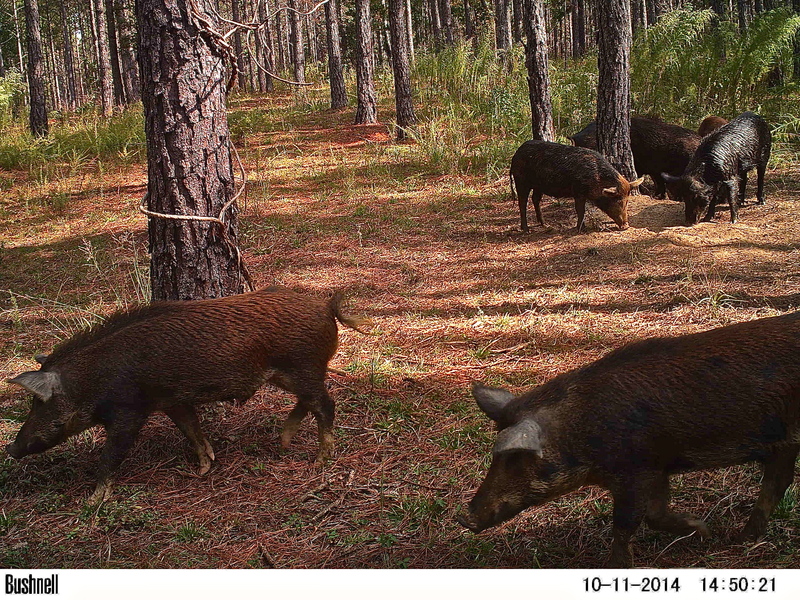 In the days before hunting the trail cameras, there are 18 of them on the property, revealed hundreds of photos and plenty of prey. There were: deer, pigs, raccoons, turkey and coyote tripping pictures of themselves. 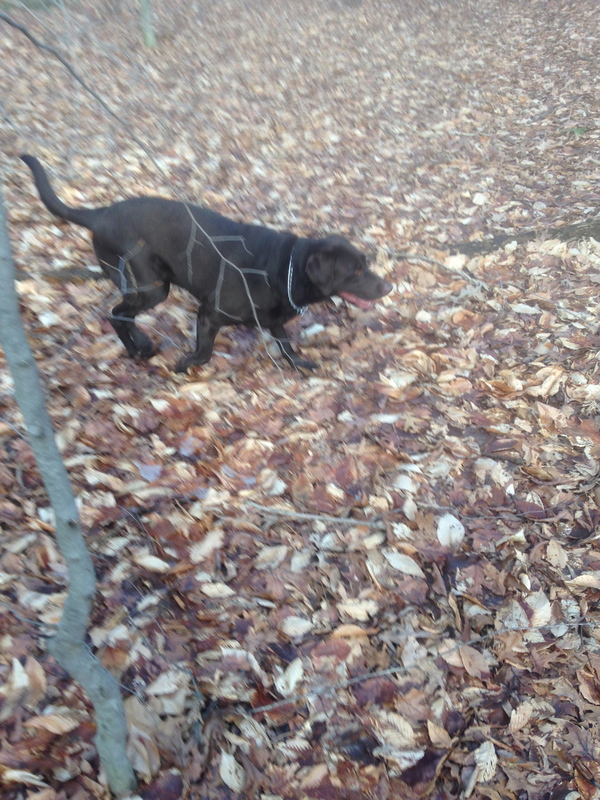 Wednesday would be our first day in the woods this week. Ray prefers going out in the afternoon. The time stamp on the pictures indicated anytime of day or night would be good. In the morning we gathered our gear and I took a few practice shots with my ZXT. 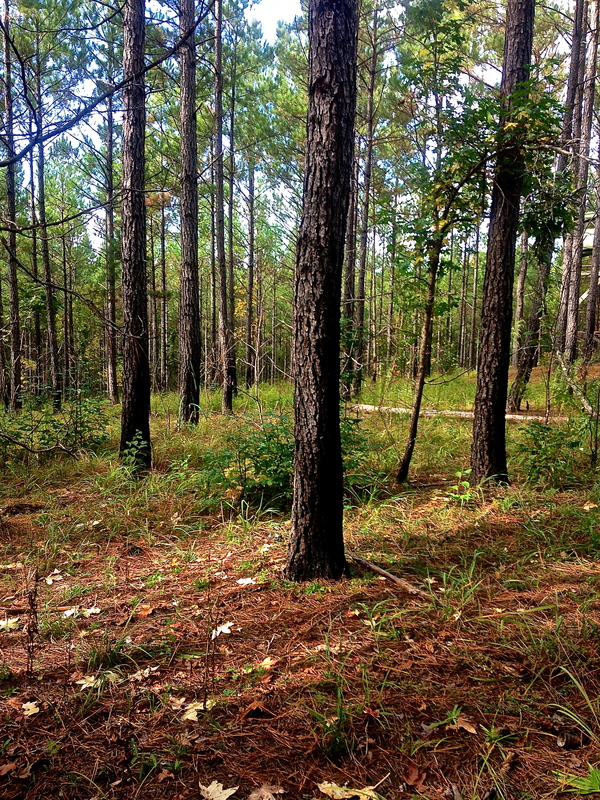 Afterwards, we packed the gear in a truck, loaded a Bad Boy Buggie then headed for the woods. Ray and I hunted about a kilometer apart. For this day we’d be shooting from the ground. Ray dropped me off and took the Bad Boy Buggie to the blind he’d selected for himself. Before leaving he gave assurances he’d return for me at 7:15 PM. It would be dark by then. These woods are thick and the trails rough but he was confident he’d find me. I was also positive I could walk back to the truck if necessary. Within an hour I heard the report of a 50 caliber. It came from the direction of Ray’s blind. I’d have to wait on learn the result of the shot. However, the gunfire made me optimistic. I remained optimistic up to 7 PM, until that time I’d only seen squirrels and birds. Ray arrived at 7:15 PM. The gunfire had not been his; we suspect we have poachers crossing onto the well-marked property. 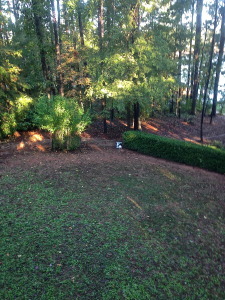 Ray had seen two deer that never approached for a reliable shot. 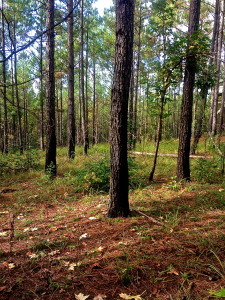 Driving out of the woods, deer covered the red clay packed trails leading out. We’ll be back out in a bit to continue our hunt. 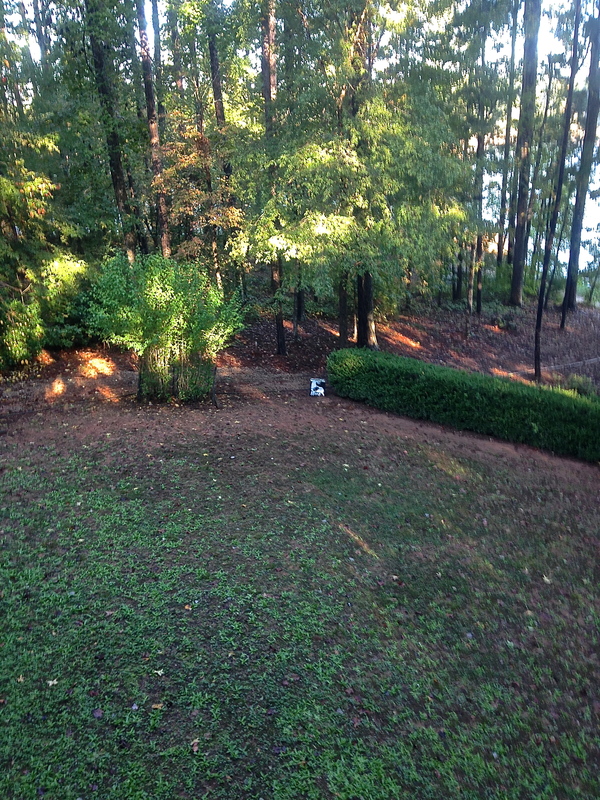 I am certain there will be squirrels and birds. After an adventure with pirates and a road race in Savannah this trip is all about archery. Near Savannah in Pooler is Wildcat Archery. The owner, Bill Henneman, opened his business over 20 years ago. When his doors first opened they lead into a shed on his property. Today, his shop is one of the nicest ones around and has an indoor range. 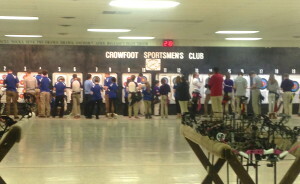 While in Savannah, I made the short trip to Pooler to shoot on that indoor range. It was a side trip of which I was looking forward. 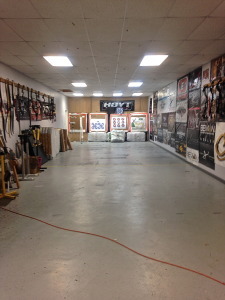 Wildcat Archery is the first place I’d ever competed on an indoor range. I remember not having a clue, hoping that I’d hit my target and not put an arrow in the ceiling. It was scary, but I did my best to follow the crowd. 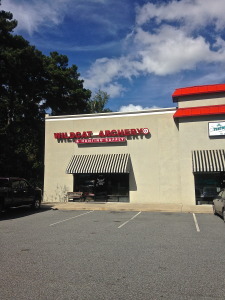 Arriving at Wildcat Archery, Tony and Steve were there working. I’d met both of them on my two prior trips to Wildcat. I remembered them; they had no recollection of me or at least gave no indication of such. What I wanted most was to shoot on their range. Another archer, Kyle, was already there practicing. Kyle was maybe 10 years old. He was shooting from 20 yards while his dad watched from a stool about 10 feet away. Kyle is good. Kyle shot a 3-spot that was arranged vertically. Each end he fired, while I was on the range, consisted of 5 to 6 arrows. His arrows were always in the yellow and with each end he placed 2 to 3 in the X. He was extremely well mannered and apparently has never met a stranger. I can’t help but wonder how far Kyle may go in archery. While we pulled arrows I asked him about archery and whether he competes. He answered he does compete but thus far only in 3D tournaments. He’d won his last tournament and hit seven 12’s. 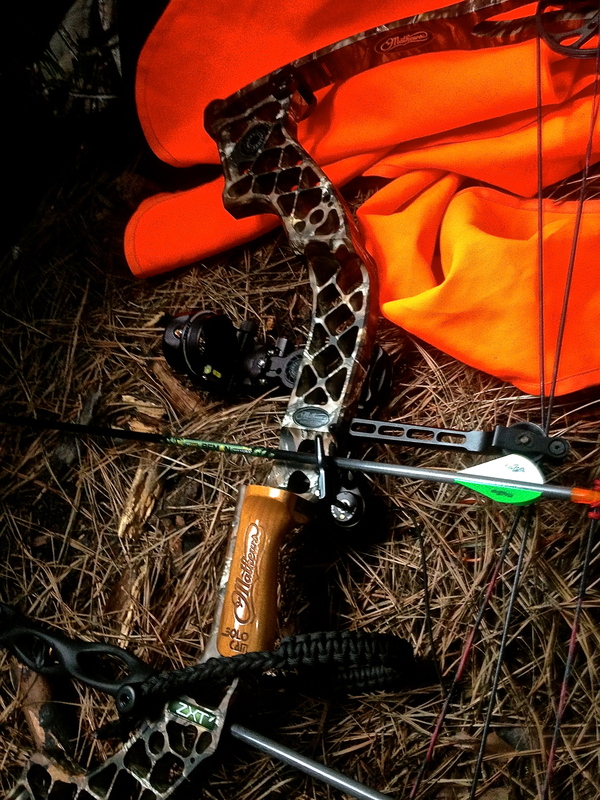 I’d brought my hunting rig with me, a Mathews ZXT, 8-inch Trophy Stabilizer, and a 7 pin ArmorTech-HD sight. I was shooting a bit off. The target was a 5-spot and the best I was hitting was 4 out of 5 shots on the X. My 20-yard pin was hitting high so I was aiming it a bit low to compensate. 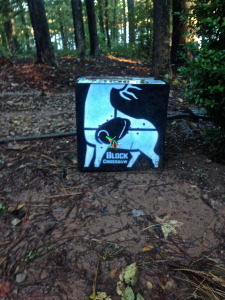 I was reluctant to change the pin knowing I’d sighted it at my range, in NC, where I know 20 yards is exact. I stopped practicing after an hour considering that if I was off there was no further point in reinforcing some unrecognized error. Before I left I talked awhile with Tony and Steve. Tony has worked at Wildcat for about eight years and Steve in moving into his second year. Both are very knowledgeable and Steve shot on the range a bit while I was there. Steve placed a small, quarter size tab onto a target then shot 3 arrows into it. 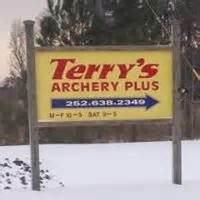 Tony, Steve and I talked for about 30 minutes and I bought some targets. One of the benefits of traveling is meeting other archers and visiting various shops. 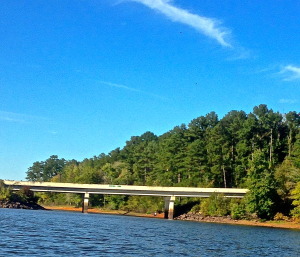 Once Brenda and I complete the renovations to our home in NC I’ll like spending winters in Georgia. 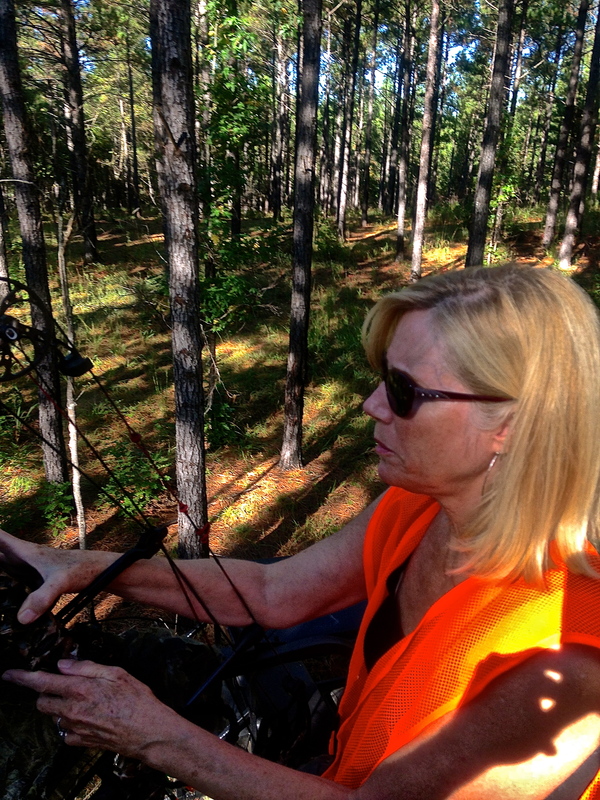 I am looking forward to that, practicing on the range at Wildcat Archery, then hunting and competing in Georgia.